This is the PERFECT time to kick start your fitness routines and start trying to incorporate healthy meals into your menu to help you achieve your health and fitness goals! Some people think that eating healthy means you have to eat boring…dry…bland food. Well that is not true at all! Today I am sharing with you several food options that should add some flavor to your meals so your healthy meals can be fun and tasty! 1. Combine whole-wheat flour, all-purpose flour, cumin, salt and cayenne in a medium bowl. Whisk in beer to create a batter. 2. Coat half the tilapia pieces in the batter. Heat 2 teaspoons oil in a large nonstick skillet over medium-high heat. Letting excess batter drip back into the bowl, add the fish to the pan; cook until crispy and golden, 2 to 4 minutes per side. Transfer to a plate and loosely cover with foil. Coat the remaining fish with batter and cook in the remaining 2 teaspoons oil; adjust heat as necessary for even browning. 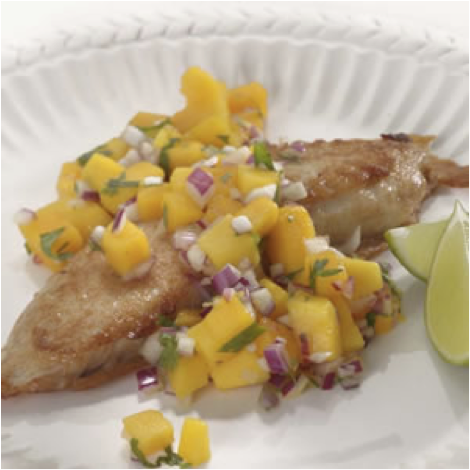 Serve immediately with Mango Salsa. Calories 242, Total Fat 7 g, Saturated Fat 1 g, Monounsaturated Fat 4 g, Cholesterol 48 mg, Sodium 234 mg, Carbohydrate 22 g, Fiber 2 g, Protein 23 g, Potassium 468 mg. Daily Values: Vitamin C 35%, Calcium 13%. 2. Divide spinach among 4 salad plates. 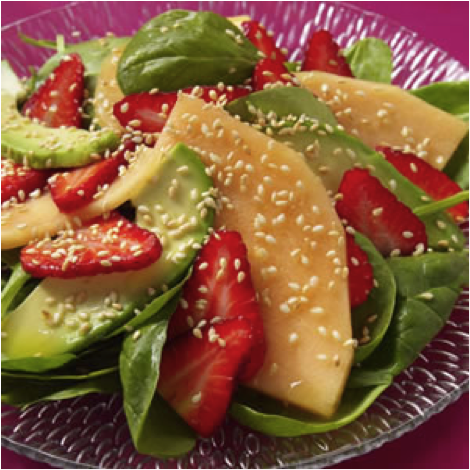 Arrange alternating slices of avocado and cantaloupe in a fan on top of the spinach. Top each salad with strawberries, drizzle with dressing and sprinkle with sesame seeds. Calories 202, Total Fat 8 g, Saturated Fat 1 g, Monounsaturated Fat 1 g, Sodium 90 mg, Carbohydrate 24 g, Fiber 7 g, Protein 3 g, Potassium 503 mg. Daily Values: Vitamin A 60%, Vitamin C 100%. 1. In a medium saucepan, bring broth to a boil over high heat. Add orzo and return to a boil, stirring once. Reduce heat to low and simmer until al dente, about 8 minutes. Drain orzo over a bowl, reserving 1 cup broth. 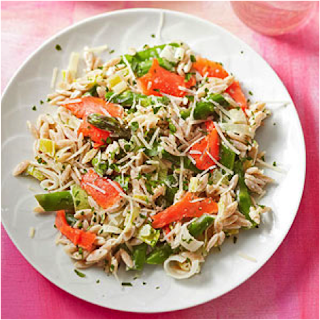 Return orzo to saucepan and stir in 1 tablespoon oil. 2. In a large skillet, heat remaining 1 tablespoon oil over medium-high heat. Add leeks and saute until softened, about 1 minute. Add reserved broth and asparagus and cook, stirring, until crisp-tender, about 2 minutes. Remove skillet from heat. Stir in cooked orzo, 1/4 cup Parmesan, sourcream, salmon, parsley and pepper. Sprinkle with remaining 1/4 cup Parmesan. Hope that these are some great options for you! REMEMBER…you can always substitute or leave ingredients out that you do not like! The key to creating tasteful healthy meals are to make it how YOU like it! Also, please feel free to stop by my personal health and fitness blog at infinitelifefitness.com!